Friends, my computer is still messing with me, but I thought that, in honor of President’s Day being this Monday – and since I received this rad picture yesterday from TD from my book club, I thought I’d share it. 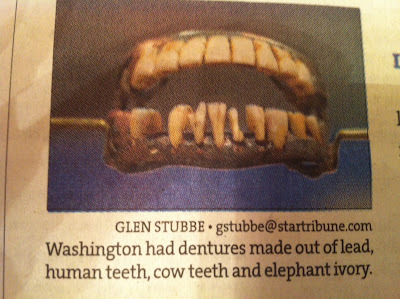 George Washington’s dentures were made out of lead, human teeth, cow teeth, and elephant ivory. Credit: Minneapolis Star Tribune; I wish I'd have know this little fact when I was a park ranger at Mt. Rushmore in college. PS, be sure to watch Headline News today. Should be interesting.